Hispanics living in the US are poorer, have harsher jobs and less access to education and health services than non-Hispanic whites. But their health is nevertheless better. So what's behind this "Hispanic paradox"? Medical experts have known for some time that Latinos living in the US have on average a better life expectancy than non-Hispanic whites. The so-called "Hispanic paradox" is even further supported by new data from the US Centers for Disease Control and Prevention (CDC). According to the CDC, life expectancy among Hispanics, the largest minority in the US, is two years longer than whites. They also have lower mortality rates in seven out of the 10 leading causes of death in the US, even though they are twice as likely to be living under the poverty line and three times more likely to lack health insurance. Experts attribute the "Hispanic paradox" to a number of factors. The Latino population tends to be younger, compared to other demographic groups. Hispanics also have lower smoking rates, better diet and better general health - at least in the first few years after immigrating into the US. Some analysts also believe that family ties amongst Latinos are stronger and help build a sense of community, contributing to a better health - especially in relation to mental health. But it's not all good news in the CDC report. Statistics show that Hispanics are more prone to die of diabetes, as well as cirrhosis and other chronic liver diseases. They are also more likely to be obese than non-Hispanic whites. 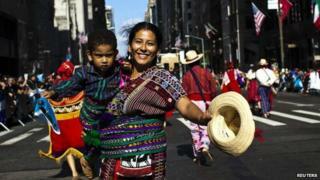 CDC experts point out that the overall health condition of Latinos varies according to their country of origin. Puerto Ricans have the worst health overall, with higher cancer rates and heart problems that any other Hispanic group in the US. This is because Puerto Ricans show a smoking rate that is similar to that of non-Hispanic whites. "This is at once good and bad news for Hispanics," says Ana Penman-Aguilar, one of the researchers from the CDC that worked on the report. "On one hand, Hispanics have lower mortality rates in seven of the 10 most common causes of death in the US but, at the same time, they die of diabetes and liver diseases at much higher rates than other ethnic groups." Ms Penman-Aguilar points out that the Latino population in the US is also facing a crisis when it comes to gaining access to health services and obtaining health insurance, due to their lower income. The health of Hispanic immigrants who have recently moved to the US tends to be better than the health of second and third-generation Latinos born and raised in the country. "Those born here have higher obesity rates, higher blood pressure, smoking rates, cancer and heart diseases," she says. At the same time, those born outside the US show worse rates of high cholesterol. Penman-Aguilar believes that higher obesity rates amongst Latinos can be linked to the fact that populations with lower income in the US tend to live in neighbourhoods with limited availability of healthy and fresh food, such as fruits and vegetables, known as "food deserts". "In the areas where Latinos and other minorities live there is no access to healthy food," Alex Ortega, Professor of Public Health at the University of California, Los Angeles (UCLA) says. Second and third-generation Latinos lose these relative advantages that immigrants have when they move to the US. "Main supermarkets do not reach them and, at the same time, fast food chains and stores selling processed food tend to proliferate in these areas," says Mr Ortega. "In these areas there are also fewer open spaces to exercise and practise sports," he adds. Ortega attributes the "Hispanic paradox" to the fact that Latinos who migrate into the US tend to be younger and healthier than the average population, and so they require less medical attention. He also believes that the CDC figures may hide what he calls the "salmon bias", named for immigrants who chose to return home. A large number of Hispanics who become ill return to their home countries to get treatment and, if they die, their deaths are not registered by US official figures. In the long term, immigrants tend to embrace the local diet, including the consumption of junk food, increasing their chances of developing fatal diseases. "Second and third-generation Latinos lose these relative advantages that immigrants have when they move to the US." Mr Ortega says. "They eat less fruits and vegetables and exercise less, while they increase the consumption of fatty and sugary food," he adds. Migrants tend to have more physically demanding jobs when they first arrive, but this tends to gradually change as they move to better jobs and develop a more sedentary lifestyle. Why are so many children trying to cross the US border?